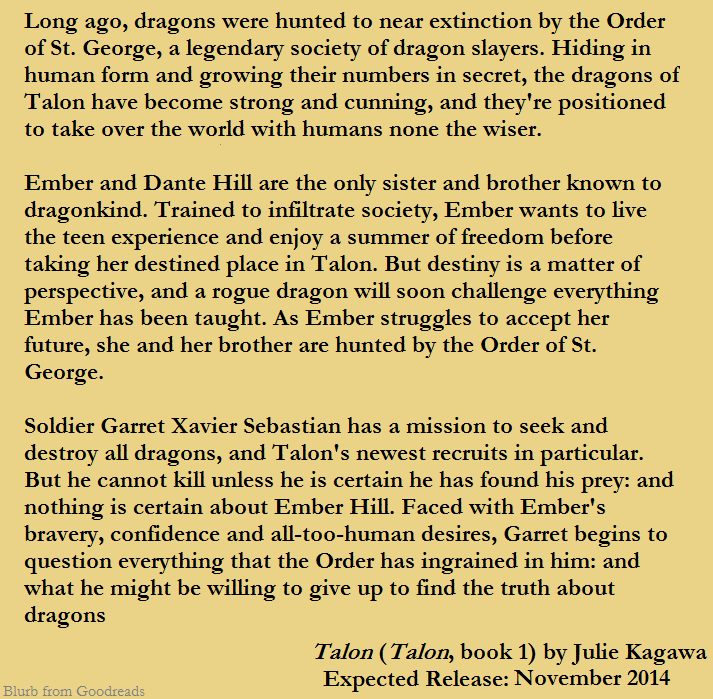 Sarah's Reviews: Upcoming Release & Movie: Talon by Julie Kagawa Book Cover, Blurb and Optioned for Film! Upcoming Release & Movie: Talon by Julie Kagawa Book Cover, Blurb and Optioned for Film! Julie Kagawa (author of The Iron Fey and Blood of Eden series) has a new series debuting this October (2014) and this one features dragons! First fairies, then vampires and now current day shape-shifter dragons, I give Julie major props for versatility. MTV released the cover earlier today with some interesting input from the author. I really like the deep colors of this cover, though the background reminds me of the Lorien Legacies series book covers for some reason. Be sure to scroll down to read the blurb and see the Talon Movie News! According to the aforementioned MTV article, the book is being adapted for the screen by Jay Basu and the film will be produced by Chris Morgan (The Fast and the Furious).